We go hands-on and preview Allgraf’s Darkout. Does it stand out in a saturated sandbox genre? All art is derivative. Every artistic work builds on what comes before it, and games are no exception to that rule. But for something to be creatively worthwhile, it has to evolve from what inspired it. A game that’s part of a specific genre will obviously conform to certain standards. However, it also needs to either bring something new or do something better than its predecessor. Darkout is a sci-fi/fantasy 2D adventure game in the style of Terraria (and Minecraft, by association). Currently in open beta, the game borrows most of its mechanics from those titles, but it also attempts to add new features of its own. However, the game’s additions aren’t well-executed in their current state, and the result is a somewhat frustrating and uninspired experience. Now I just need to chop down some trees, find coal and build a house… wait, this feels familiar. You control a survivor whose escape pod has crash-landed on Illuna, a dangerous, harsh-but-beautiful world with exotic flora and fauna. Upon arrival, you’re tasked with building a structure that will protect you from the shadow creatures that inhabit the world during its prolonged night. As the game progresses, you’ll research new technology, build various items and equipment and expand your base as needed. Darkout’s main additions to the genre besides a sci-fi theme include several mechanics, most of which actually detract from its enjoyment. 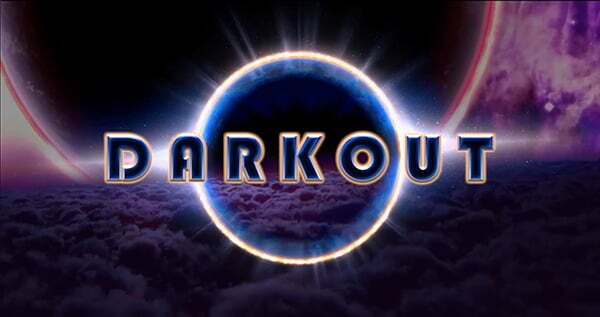 The first thing you’ll notice about Darkout—as the name would suggest—are its lengthy nights. It’s dark out (get it?) about 75 percent of the time. Out of a 24-minute day, night makes up around 18 of those minutes. This could have been a somewhat interesting gimmick if the game didn’t make it next to impossible to venture outside at night. In Minecraft, you’re given the option of sleeping through the night and continuing your questing in the morning with the sun on your side. There’s no such option (yet) in Darkout. Another feature that Darkout adds is its combat system for dealing with shadow enemies. In order to kill even the basic enemy, you have to first weaken it with some form of “light” damage, whether that’s a glow stick, flaming arrow or something else. This is another mechanic that disguises itself as innovation, but in reality it’s just a handicap. Before I learned about this mechanic, I set out to craft myself a sword. “That will help me deal with these pesky demon spiders!” I thought. Little did I know that a glow stick is actually a more effective weapon than a sword. Since you have to hit an enemy at least once with a glow stick to kill it, you might as well just finish it off with that weapon and not mess around with switching to your sword. Now, the sword would be useful against higher level enemies… if they didn’t basically one-shot you right after spawning. Here’s the problem with the enemies in this game—they’re too difficult, at least early on. Even two of the basic enemies will kill you, and while there is no punishment for dying, you have to respawn at your base and set back out again every time you die. And because there are so many enemies (they literally swarm your base at night), it’s almost impossible to travel more than a short distance without dying. Despite its gameplay issues, there are redeeming qualities to Darkout. It’s definitely not an awful game. The research system is different enough to be interesting, and there are some cool items you can craft (eventually). Unfortunately, the crafting and inventory systems require a bit too much micromanaging to deal with if there are enemies around, making the game even harder. Overall, there’s a huge burden of knowledge to this game for new players that’s only complicated further by its problematic interface. I finally figured out how to use the gun. It uses arrows as ammo–how did I not think of that? Because Darkout is still in development, there is hope for the game. Almost all of its current problems can conceivably be fixed before release—primarily the day/night cycle and the combat system. Days need to be longer than six minutes. Just because the game is called “Darkout” doesn’t mean it has to be dark all the time. It could just mean that the nights are extra dangerous, and that you never want to be caught when it’s dark out (GET IT???). And if the developers are set on using light as a primary combat mechanic, then the enemies either need to be toned down in power or in number, at least in the early stages of each world. In addition, high-level enemies shouldn’t spawn so close to the player’s base. Lastly, the inventory and crafting systems need interfaces that are a little more user-friendly and don’t require so much data entry. And, of course, the games many bugs will need to be ironed out before release. If most of these changes are made, Darkout could find its niche as a sci-fi 2D adventure game with enough new material to make it a worthwhile purchase. However, in its current state, Darkout isn’t just derivative—it’s regressive. Just play the new Terraria update instead. Alex is a recent journalism school graduate living in Phoenix, AZ. He's primarily a PC gamer. He spends his free time playing video games, drinking energy drinks and power-watching entire seasons of television shows.